There are many different techniques different knifemakers and bladesmiths use to design their knives, and methods vary from maker to maker. 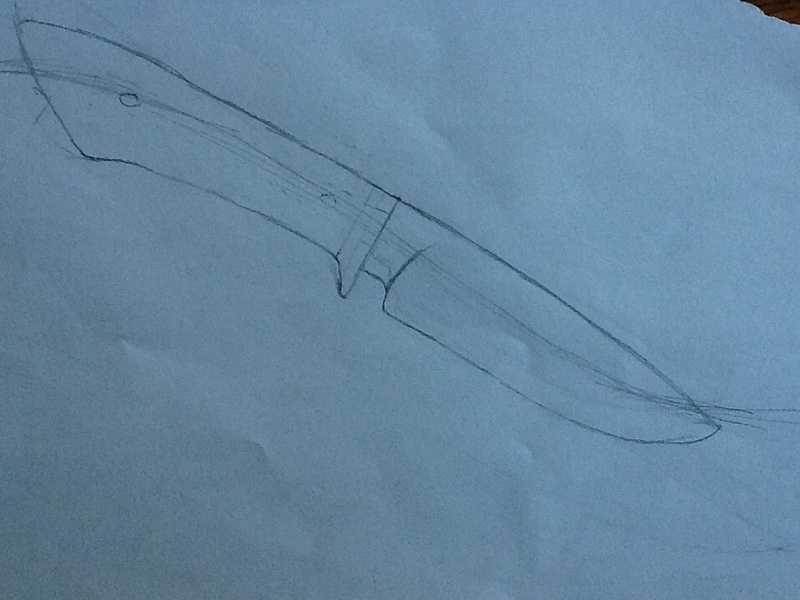 That said, this is not the only way, the best way, nor the most commonly used way to design a knife, it’s just my way. I start out two ways, one by making a blade and designing the handle off of that, or designing the whole thing prior and then working off of that. Unless if I’m doing a custom job or stock removal, I tend to do the former way. In the former method, I start out imagining what sort of blade I want (skinning knife, bowie knife, dagger, etc. ), taking bar stock (rough untouched steel), and begin forging it to the general shape I have in mind, tweaking and refining as I go along to whatever is aesthetically best. Once the blade is done or near done and shaped to how I want it, I trace it on paper and work the handle off of it. If I am to design the knife before making it, I sit down with a pencil and paper and the type of knife in mind, and always start out with sketching the blade. I make two dots on the paper, to mark the tip of the blade on one point, and the other end of the blade at the other, based off of what length I want. I then slowly sketch in between the two points, making many small strokes, until I have the general shape of a blade in mind. I then erase these strokes and do it again, (erasers never completely obliterate the trace of pencil marks) erasing and re-drawing until I get a shape I am happy with. Once I’ve done this, I use an interesting trick I learned a while back. I draw a “flow line”, from the tip of the blade and through its center, following the “flow” of the blade. I continue this line in the same flowy motion past the blade and into the blank space behind. I lightly erase this line and begin sketching the handle, using the flow line as the central skeleton. Using this technique gives a very good flow from blade to handle, which is essential to a good design. As a solid rule, if the knife has a bowie-style ricasso, I always draw the beginning of the the handle the same width as the ricasso, which further adds to the flow. I sketch, erase, and repeat until I get something I’m happy with, copying different knife styles especially with the pommel. I then draw in the guard, copying whichever type I like best. I never draw the front portion of the guard further out than the heel of the blade. Note the small ridge on the back of the handle near the pommel, how it bumps up a little bit and alters from the flow line. This entry was posted in Uncategorized on February 17, 2015 by Captain Belaq. Stainless steel knives can be soaked in use, cut acidic foods, dropped in the dishwasher and when they come out have not a stain or sign of rust on them, which is why the general public is endeared to them. Carbon steel is in fact superior in almost all ways save rust and patina. To know why, we need to look at the steel scientifically. The rust resistance of stainless steel is due to Chromium. When Chromium is exposed to air, it bonds with the oxygen and creates an oxide, just like iron does (when iron bonds with oxygen, it becomes iron oxide, which we know as rust). Unlike iron however, chromium oxide is extremely hard and tough, so when chromium is exposed to air it gets a layer of super hard, microscopically thin chromium oxide (in fact, rubies and sapphires are made of chromium oxide). Because there is a layer of chromium oxide already there, more oxygen cannot come in to bond with the chromium beneath. With iron though, the iron oxide (rust) is very soft and flakes or falls off easily, exposing more iron to be oxidized, and so it gradually falls apart. Chemists in the late 1800’s figured this out, and started to add a small bit of chromium into the steel mix. This chromium created a layer on contact with air, which protected the steel from further oxidization. The problem with chromium though, is it hinders the effect of Carbon, which hardens the steel, thus making it nigh impossible to get as hard as a pure carbon-iron steel mix. The harder a steel is, the harder it is to dull the blade. 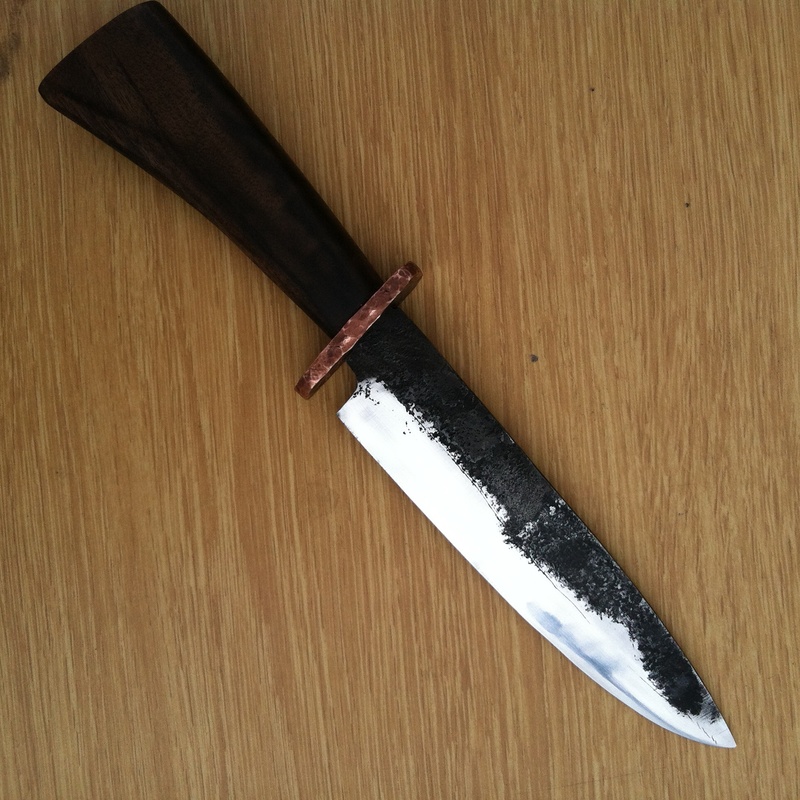 The pure carbon and iron mix can be manipulated quite easily, which also means the knife is going to be very tough. Carbon steels can also be gotten a lot sharper, as the steel doesn’t get ground away or domed on the edge when sharpening as easily as a stainless knife will, due to the softness. So even though Carbon steel knives need to be oiled and well cared for in storage, in use, carbon steel outperforms stainless, in both how well they can get the job done and how fast they can get the job done. This entry was posted in Uncategorized on February 12, 2015 by Captain Belaq. 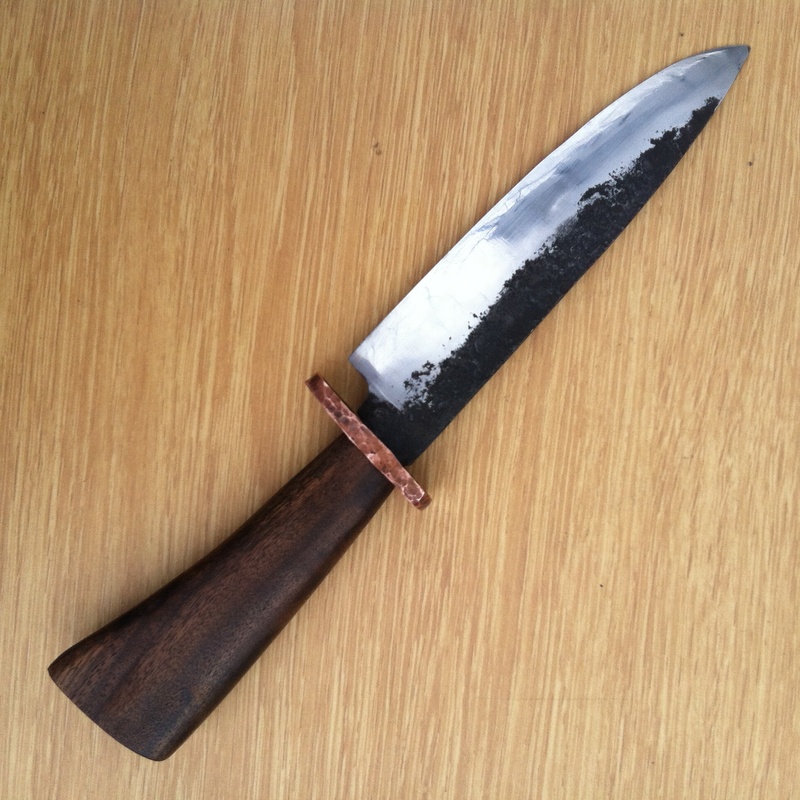 5160 blade, hand forged from leaf spring, textured Copper Guard, and Black Walnut handle, oiled and sealed with beeswax. $40 plain, $50 w/ sheath. This entry was posted in Uncategorized on February 5, 2015 by Captain Belaq. The “Tang” is the steel part of a knife that extends back from the blade into the handle. There are two types of tangs, Full Tang and Stick Tang. Full tangs extend back and follow the shape of the handle, with the scales (wood, plastic, etc.) sandwich it on either side. Stick tangs (also known as hidden tangs), on the other hand, are fairly thin rods that extend back, sometimes all the way to the pommel. Stick tang, or hidden tang, knife construction. Whichever way is chosen by the maker generally depends on style of knife, and types of handle materials. I personally prefer to make stick tang knives more, as my favorite knife styles are bowies, which generally look better as a stick tang construction. Technically, stick tang construction is weaker, which leads many people to the misconception that stick tang knives are weak. Let me explain. Full tang knives more or less have the strength of a bar of iron, more than enough strength to do general cutting jobs, including hacking through branches. Well made stick tang knives are weaker than a bar of iron, but not nearly enough to make them likely to break when doing heavy cutting jobs. This may seem counter intuitive when you look at how thin the tang seems, but remember that most of the stress and pressure (the place most likely to break) is only about a centimeter back from the blade, and so the amount of leverage (if you remember physics, if you increase the amount of force but decrease the length through which it acts, total force on the lever does not increase) is miniscule. Stick tang knives can hold up to any task full tangs are designed for, with strength to spare. This entry was posted in Uncategorized on February 4, 2015 by Captain Belaq.